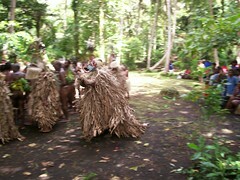 It was my privelege to witness a grade taking ceremony and Rom Dance in North Ambrym, Vanuatu. 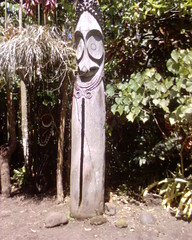 Ambrym is one of the islands on the small island nation of Vanuatu in the south Pacific. 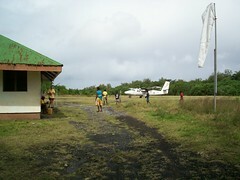 map Its airstrip is at Craig Cove in the west of the island, it is about 40 minutes by air from the capital Port Vila. The centre of the island is the caldera of an ancient volcano which has filled with volcanic ash to become an ash plain. Due to acid rain from the active craters, Mt Marum and Mt Benbow, it is infertile. It separates the three fertile and habitated regions. The only transport between these regions is by small motor boats though historically there have been walking routes over the ash plain. The intervening coastal areas are impassable because of thick jungle and rugged terrain. The trip to North Ambrym from West Ambrym took 3 hours in a small motor boat. In addition to the half dozen or so land based tourists, a number of international yacht people had converged on Nebul beach, North Ambrym. Typically they had been at sea for months or years and had heard of the festival via the yachtie community. 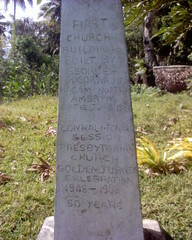 The coastal villages have been influenced by European missionaries and traders for many years. 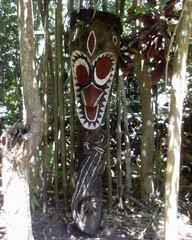 Generally, the inland villages have maintained their animist beliefs and customs and are described as kastom villages. The coastal villages are typically devoutly Christian, French speaking Catholic in the north east and English speaking Protestant in the North West. 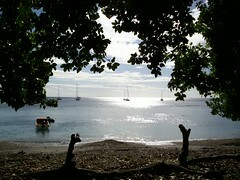 The coastal village of San Lui, though French Catholic, held the ceremonies in August 2007. The two reasons given were to (a) maintain traditional customs (kastom) and to (b) raise money for scholarships for the EU funded French speaking school at Topol nearby. North Ambrym has a rich and diverse culture which is increasingly seen as worthy of preservation. 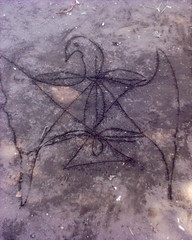 For example In 2003, 'Vanuatu Sand Drawing' was proclaimed a "Masterpiece of the Oral and Intangible Heritage of Humanity" by UNESCO. 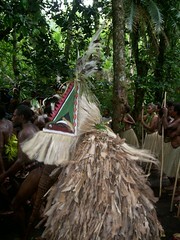 The ceremonies were held at Halhal, the traditional ceremonial grounds or Nasara of San Lui village. 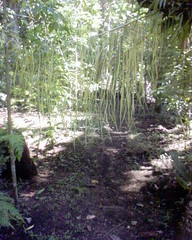 The path was marked by a grass curtain, traditionally used to mark tabu areas, along with plantings of colourful plants. Grade taking is the process whereby authority was established in kastom villages. The suitability was established, by among other things, having the wealth to provide a pig for ritual slaughter. The Rom festival relates to the yam harvest and planting. Yam and taro are food staples in Vanuatu. The ritual slaughter of pigs is an important part of grade taking. A chief proves his ability to provide food. The food is divided, probably through the complex web of kinship, which I do not pretend to understand. At the end of the ceremony we were told that it takes $1000 to educate a child for one year. A large expense for a subsistence economy. Donations can be sent to Topol School, via Olal, North Ambrym, Vanuatu. They hope to hold the festival again next year. I'll post details if I get any.